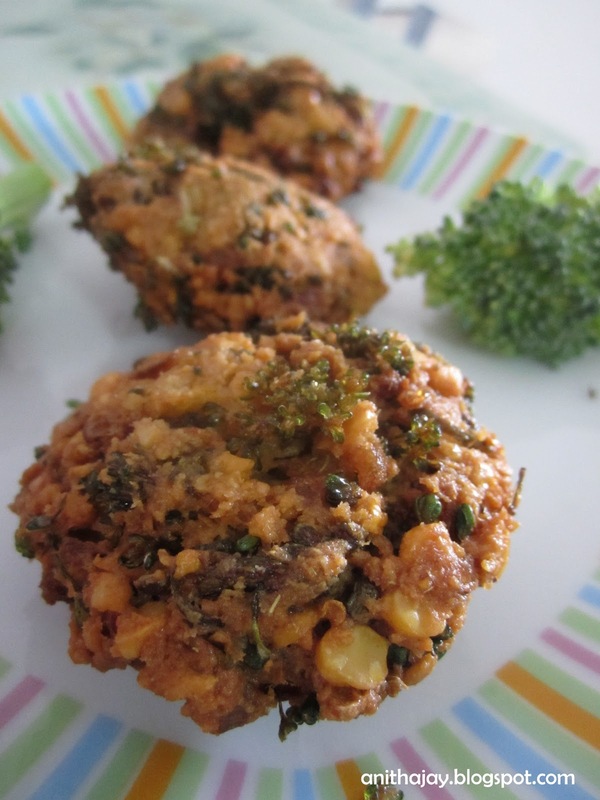 Masal vadai transfer into healthy snacks by adding the broccoli. We can either fry this as a vadai or fritters. Soak the Channa dal for minimum 1 hour. Drain the water and grind it along with ginger and fennel seeds without adding water. Mix chopped onion,Green chilli, Ginger,broccoli ,salt and curry leaves with Channa Dal. Divide the mixture into equal size balls. Heat oil in a pan ,Flatten the balls using the palm and drop into the oil. Fry on each sides in a medium flame. Drain excess oil with paper towel and serve hot. Sending this recipe to What's with my cuppa hosted by Nivedhanam. Love this vadai,i do quite often like this.